Marco Polo Pocket Guide Venice: the Travel Guide with Insider Tips. 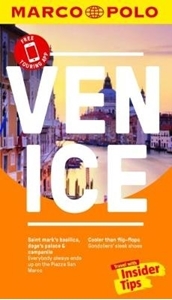 Explore Venice with this handy, pocket-sized, authoritative guide, packed with Insider Tips. Discover boutique hotels, authentic restaurants, the city's trendiest places, and get tips on shopping and what to do on a limited budget. There are plenty of ideas for travel with kids, and a summary of all the festivals and events that take place in this breath-taking Italian city. Let Marco Polo show you all this wonderful city has to offer... With water everywhere and not a car or scooter in sight, no other place is as fun to explore as Venice. Experience the wonderful atmosphere of this traffic-free city: whether walking along its alleys, crossing its bridges or relaxing in a gondola on the Grand Canal, this practical, pocket-sized guide shows you all the highlights. This is Venice! Your Marco Polo Venice Pocket Guide includes: Insider Tips - we show you the hidden gems and little known secrets that offer a real insight into the city where you can discover hidden areas of the lagoon on traditional wooden barges, the most delicious ice cream in town and creative cuisine served on an idyllic terrace. Best of - find the best things to do for free, the best `only in' Venice experiences, the best things to do if it rains and the best places to relax and spoil yourself. Sightseeing - all of the top sights are organised by areas of the city so you can easily plan your day. Discovery Tours - 4 specially tailored tours that will get you to the heart of Venice, on foot or by boat. Experience Venice's unique charm, historic canals, magnificent buildings, hand-picked restaurants and the best local activities with these personal tours. Venice in full-colour - Marco Polo Pocket Guide Venice includes full-colour photos throughout the guide bringing the city to life offering you a real taste of what you can see and enjoy on your trip. Touring App - new for 2018, you can download any of the Discovery Tours to your smartphone, complete with the detailed route description and map exactly as featured in the guide, free of charge. The maps can be used offline too, so no roaming charges. The perfect navigational tool with distance indicators and landmarks highlighting the correct direction to travel in as well as GPS coordinates along the way. Enjoy stress-free sightseeing and never get lost again! Street Atlas and pull-out map - we've included a detailed street atlas and a handy, pull-out map so you can pop the guide in your bag for a full-on sightseeing day or head out with just the map to enjoy your Discovery Tour. Useful Italian phrases - the essential words and phrases are included to help you get by. Trust Marco Polo Pocket Guide Venice to show you around this unique city. The comprehensive coverage and unique insights will ensure you experience everything Venice has to offer and more. The special tips, personal insights and unusual experiences will help you make the most of your trip - just arrive and enjoy.